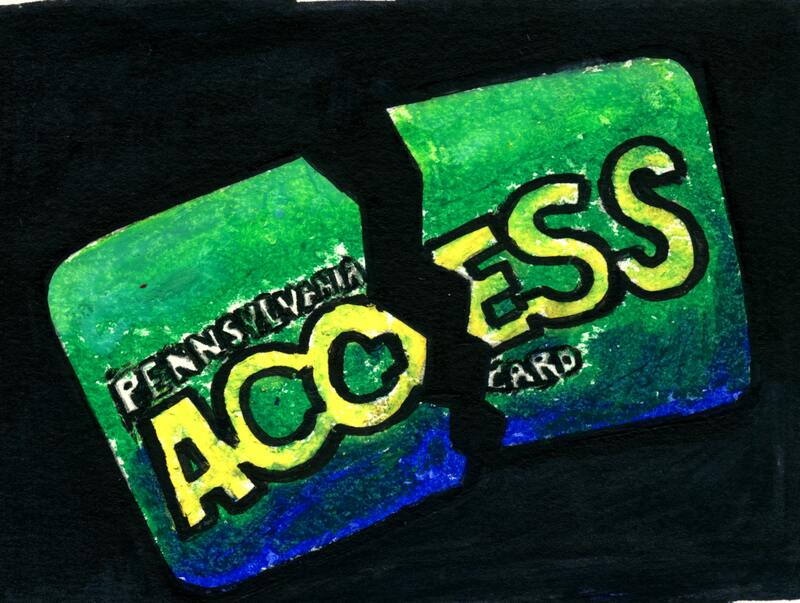 Image caption: a Pennsylvania ACCESS card broken in two. In June, the House of Representatives passed their version of the U.S. Farm Bill in a controversial vote of 213 to 211. Philadelphia might not have too many farmers, but only a small portion of the bill has anything to do with farming. Over three-quarters of the money allocated by the farm bill goes to the Supplemental Nutrition Assistance Program (SNAP). The House and Senate had until September 30 to pass a compromise of their separate bills, but the deadline passed and the law expired. SNAP (“food stamps”) is at the center of the controversy, with House Republicans calling for stricter work requirements. The proposed work requirement would require SNAP recipients ages 18 to 59 who are not disabled or raising a child under 6 to prove every month that they spent 20 hours a week working, engaging in an approved work or training program, or doing a combination of both. SNAP already has a work requirement. It states that people aged 18 to 49 who are not disabled and are not raising children must fulfill an identical 20 hours a week of work or time spent at an approved program. However, under the House Republicans’ structure, these work requirements would now apply to those in their 50s and parents with kids who are all 6 or older. Additionally, their structure would require monthly reporting. If you received a sudden shift change or were fired near the end of the month and could not find an approved program by the month’s end, you would be removed from SNAP. Although the Farm Bill didn’t pass, SNAP is an entitlement, so it is safe—for now. But it continues to face attacks in Pennsylvania and nationally. One reason for the advent of SNAP, and the welfare system as a whole, was to create a social safety net: a system that we call upon in an emergency for support. Work requirements undermine this mission. Whether it’s losing a job, a family health emergency, or a sudden eviction, we can lose hours of work for reasons outside of our control. But losing or dropping shifts rarely means you suddenly have more time. It is a full-time job to manage an emergency. Households facing emergencies should not face additional hurdles to receive the support that they deserve. In an economy where many families simply cannot find jobs with decent pay or sufficient hours, food stamps are a necessity. Threatening households with stricter work requirements will not make decent paying jobs appear, or make managers schedule workers for more shifts. It just means hungry families. According to this same report, if the House Republicans’ work requirements were implemented, 2 million low-income people would lose their benefits altogether. Not included in the data are the many millions of children who rely on the benefits of these recipients. As Vox reports, 76% of SNAP benefits go to households with children. Underlying all of this is the astounding fact that SNAP is an effective government program. SNAP feeds 40 million people, which represents approximately one in eight Americans. In Pennsylvania, 1.8 million people use it—approximately 14% of the state. Almost despite its own byzantine bureaucracy, SNAP maintains tremendously low costs. The average cost per person per meal is $1.40. Less than 7% of SNAP funding goes towards administrative costs. Even the American Red Cross spends slightly more than 10% of their budget on overhead costs! As you might expect, fraud is a real problem—a real tiny problem. Only 1.5% of SNAP funds are used fraudulently. Let’s not forget study after study demonstrating that SNAP improves both basic child health measures and the long-term outcomes of those children well into adulthood. Democrats would rather SNAP stay as an emergency safety net, but why shouldn’t we push to expand a successful program? Many are increasingly ready to say that healthcare, and for some housing, is a right—because a right to life cannot be preserved without health or home. We guarantee public education for our children because every child deserves a quality education. Every person deserves decent, healthy meals. Every child has the right to grow up healthy and strong. Why should we leave the provision of food to exploitative big box stores like Wal-Mart and Amazon? In countries with government-run single-payer healthcare systems, the government can directly negotiate with powerful pharmaceutical companies and hospitals to lower costs. Imagine a universal food program that can directly challenge the wealthy industrial agribusiness farms and greedy Wall Street commodity speculators to guarantee affordable food prices. Imagine a food provision service that paid a decent living wage. We have a right to decent food, but many in America are going hungry. According to the USDA, in 2016, 12.3% of all households suffered from food insecurity at some point that year. In 2016, more than one out of 10 households went hungry, at least for a short bit. Some for longer. If the markets and the rich won’t give us either the food to eat or jobs and pay so that we can buy it, then we have no choice. People shouldn’t go hungry just for being poor. We need to demand a solution. Demand a universal food program. See how to apply for SNAP here.